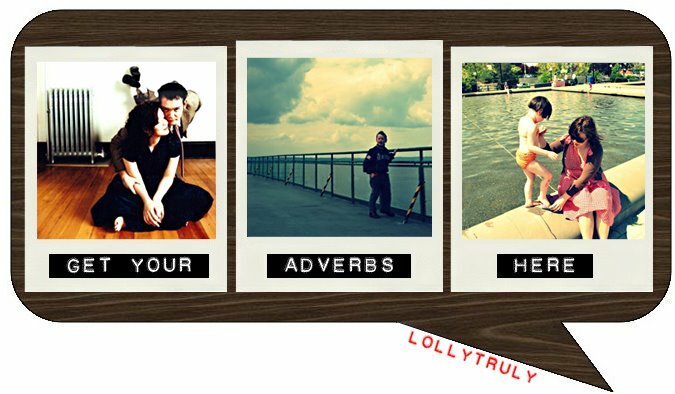 Get your adverbs here. : honesty? is that what you think this is about, dylan? honesty? is that what you think this is about, dylan? Have you been watching the Real Housewives of NY? They’re such complete and utter twats. I love it. This morning Eric Idle was on Adam Carolla and so was Dr. Drew (I love all 3 of those people) and Dr. Drew went “Comedy is an anti-social thing, it’s sort of aggressive, people with trauma histories often use comedy to vent.” Eric Idle: “Certainly.” I think that is very INTERESTING. I am going to think about that. Then later Drew said “Don’t you wish you had the command over the Queen’s English like the British, don’t you wish you could express yourself like they do?” and Adam went “I feel like the dumbest guy in England sounds twice as smart as our president.” El oh el! Lately when Lara and I run around the lake, Judah comes along on his razor scooter. It’s super fun. Lara chases him and makes monster noises with complete inhibition, to my great delight. And here’s some goodness with Dylan & Brenda. God, I don’t remember the acting being this bad. God, I loved that so much when Dylan and Kelly stuck it to Brenda!!! Eeeeek! I hated her so much, I wouldn't even say her name. I just called her "B". I saw that episode like a year or two ago and even then I didn't even notice it was so bad since I had been watching it every day. You get use to it. haha I don't watch it (can't watch t.v. on my t.v. only dvds)...so I wouldn't know. Did you hear did you hear?! CW to create spin-off of 90210 for real! it's gonna be so good i won't be able to stop watching. The NY housewives are so much more evil than the OC housewives, whodathunkit? i kinda wanna punch them in their throats when i watch them, but they always keep me coming back for more. So far my favorite is when the Countess refers to her husband as The Count in her interview blurbs, as in, "She called her husband stupid, she told him to leave. i would never dare speak to The Count like that." *LOVES IT! * Those twatty, bitchy, funny little housewives.